It’s official, August is here. And to many, that means the lazy days of Summer are coming to an end. 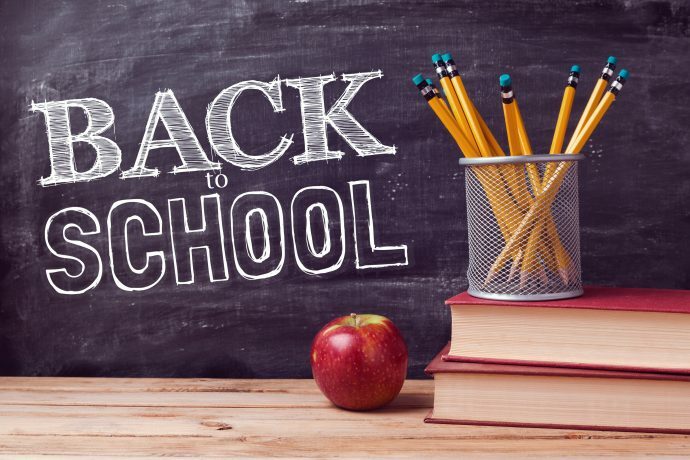 Whether you go back to school in early August, or not until after Labor Day, now is the time to prepare. Backpacks, school supplies, new clothes…the shopping list is long and the to-do list sometimes overwhelming. I’m probably not the only one holding on to the fleeting days of Summer, but I also look forward with anticipation to Fall! New friends and teachers, sporting events and extracurriculars, and non-stop opportunities for new church programming. There is a flurry of Fall events designed to welcome new community members as well as strengthen long-time church member relationships. Do you have certain activities already on your church calendar? Sunday school, football viewing parties, Fall festivals, holiday bazaars? These are all wonderful ways to usher in cooler weather and create a sense of community, but what about trying something new this year? Back-to-School Fair – Help parents and kids in your community celebrate the new school year by hosting a fun event at your church. Set up stations around your church parking lot or campus—face painting, photo booth, ring toss, cupcake walk, craft table. Invite the teachers, coaches, and principals from your church and local schools to be your celebrity guests. Teacher Appreciation Day – Provide baked goods, fruit, snacks, and coffee in the teachers’ lounge of a local school. Write notes of encouragement to the teachers for a great school year. Another idea is to cater lunch on an in-service training day. Adopt-a-Student – Is your church in a college town? Encourage church families or small groups to “adopt” a student at the beginning of each semester. Give them a tour of the town and point out popular local spots. Invite them for meals or special holiday celebrations. Students usually appreciate a free meal and a place to do laundry. School Day, Moms Pray – Host a tea for moms just after they drop their kids off for school. Seat them by school or child’s grade level for fellowship. Pray for the moms and the children. Provide a list of church activities and worship times. Or how about any of these ideas from Outreach Magazine? Host a back-to-school clothes sale – Sell gently used clothes to your community. Give proceeds to your nearest schools. Start an after-school ministry – Serve children outside the church, as well as congregants’ kids, with a structured, low-cost program. Separate kids by age and schedule homework time, snacks and outdoor and indoor play. Tutor local students – Each Saturday during the school year, open your church building for students to come and receive free, one-on-one tutoring from high school students and adults. Include refreshments. Support the local team – Before local high school football games, host tailgating parties in your church parking lot for fans – consider holding a raffle for football-themed prizes. You can also connect with athletes in your community and their families by providing a meal and gathering place after games. Provide college-application assistance – Host workshops to help high school seniors with their college applications, including essays. And don’t forget Blessing of the Backpacks, school supply drives for your local schools, or hosting seminars on timely topics like social media and bullying…Whatever your church decides to do with programming, we recommend incorporating music. Music is scientifically proven to increase happiness and lower stress…both . are vital during this hectic time of year! But to keep things completely stress-free make sure you don’t overlook the necessary music licensing. It’s vital to include reviewing the use of copyrighted material in your planning. A great place to start is with CCS’s online Copyright Quiz. In just five minutes you can quickly analyze your church’s compliance and identify where the holes are in your licensing coverage. If you have any questions feel free to give us a call at 877-394-5566 or live chat with one of our copyright experts. Interested in learning more about copyright law and how it affects your church? 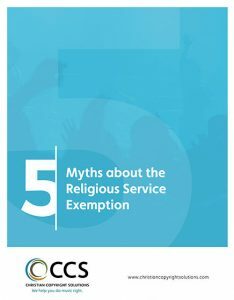 Enter your information here to download the 5 Myths about the Religious Service Exemption. It adds clarity to some of the top areas of misinformation regarding copyrights. About Toni Kemper: A mother to three and marketer by trade, Toni is a graduate of Loyola University New Orleans. She joined the CCS team in 2016 as the Communications Coordinator and jumped right in learning the ins and outs of church music and copyrights. Toni is passionate about writing and enjoys contributing to the CopyrightCoach. She is also passionate about education which fits right in with CCS’s mission to educate the church community on copyrights, as well as why you will find her volunteering in the Children’s Ministry department of her church in Fairhope, AL.